DID GREECE PULL OUT OF DEBT USING CRYPTOCURRENCY? Bitcoin In A Financial Crisis. What does cryptocurrency represent to you? Maybe it has been a good experiment, learning how money functions, and new technologies, new mechanisms, a direct connection to the world, blockchains, anonymity etc. But for some countries it might represent a new start, an alternative currency that might save an entire nation. Greece is a representation of centralized bad governance guilty of generating an unpayable debt and bringing an entire country to its knees. “Greece´s economic crisis is a demonstration of failure of central banking” — Says Greek Cryptocurrency expert Andreas Antonopoulos. The idea of cryptocurrency may or may not be a wild suggestion to save these people from a financial crisis that has never been seen before anywhere else. What Greece´s population has been living due to this tragedy is simply inhumane. Their story is devastating and definitely not told enough. After WWII, European countries decided to stop fighting amongst themselves, and put down their barriers because they understood it was not good for their economy. Not being able to trade between countries in their own continent was bad for everyone. So as a political move they came together in a treaty called Maastricht Treaty, a total of 27 allied countries, the aka: European Union. Once they unified, they could no longer have many currencies and that’s where EURO zone was born, January 1st 1999. 27 unified countries, 27 different economies and all with completely different needs, into 1 single coin, 1 centralized bank. Did they really believe this was going to play out well? There´s an old saying that says “Two wolves and a sheep deciding what to eat” — Might fit the scene perfectly. Maybe this was the plan of the big wolves all along seeking sovereignty. Scratching the surface of Greece´s Crisis. Greece joined the EU in 1989 and adopted euro in 2001, leaving their local fiat drachma behind, but dragging along bad financial governance, bad country management, where by habit, most of its people did not pay taxes. Generally, tax money is how a country takes care of its needs, and debts. No tax money equals to a disastrous ending for any country. Once they became a part of the European Union, Greece with all its debt, obviously still responsible for its debt, suffers badly with the 2008 recession. Now, Greece starts making more debt to pay their debt by borrowing money everywhere, with a good response from the lenders, due to the fact that Greece was now a part of the EU and Euro. Lenders automatically assumed that in case they didn’t pay for their loans, that the EU central bank would come to the rescue. So Greece ended up in a bigger debt they could have possibly imagined. Drowned in 382 billion U.S. dollars in debt — that will probably never be paid. Greece is a very small country with a population of a little over 11 thousand people, where 60% unemployment is among 30 year olds and under. An entire nation suffering the results of a collection of bad decisions. For a long time, EU refused to come to the rescue of Greece, and only came into an agreement through austerity, an unpopular method with very rigid restrictions, with the intention of reducing budget deficit. This debt and austerity measurement has dragged Greece’s population to suicide; a rating of 1.6% went up to 7.8% according to studies done by Philip Philippides a lecturer at the School of Public Health at Imperial College London. Studies show a birth rate fell to an annual rate of 3, 9%, and that depression, suicide and infant mortality have worsened during this entire crisis. In June 22nd 2018 an unformal meeting took place at SYRIZA and Independent Greeks in Athens, to set up a new sustainable agreement for Greece´s government to pay its debt. Alexis Tsipras, 43 year old prime minister in Greece, who finally had a red tie on his hand, as promised, to represent his happiness with the new agreement. The promise was that he would not wear a tie until a sustainable agreement for the debt payments had come to take place. 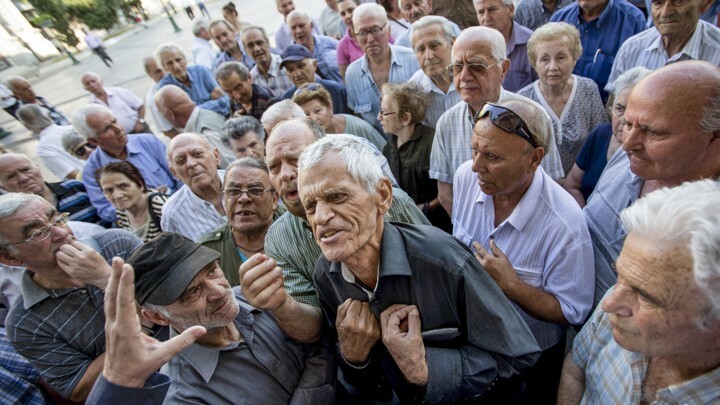 “I have to say, the Greek government is happy with this deal. And I believe Greece is turning a page.” — Finance Minister Euclid Tsaklotos said this after the marathon talks in Luxembourg. After an 8 year austerity bailout program, which may seem like “help” but in reality the 320 billion dollars received went right back to the banks, without any new jobs being created, taxes going through the roof, and public consumption being cut down. All Greece was left with from this austerity was more poverty, and MORE DEBT, with extremely high interests. Now, here is Greece facing this new informal agreement, without an official sign-off, supposedly will boost the government’s cash reserve, pushing back the first payments to year 2033. It is believed that this time given will be allowing Greece to “breath” a little. The agreement may sound like a good deal, but in truth it has only pushed back a huge debt without any partial cancellation, cursing its future generations for at least the next 40 years. Future tax payers and workers will be the ones suffering the consequences. There´s a denial in the air, contrary to what one would probably believe, Greece is very faithful to the European Union and doesn’t seem to connect its fall to the Euro. In 2015, banks closed, ATMs were inoperable, locking in people´s money, inhibiting tourism, especially because people could not use their cards for their trips. The Hypothesis of Greece leaving the Eurozone at this time was nicknamed #Grexit which stands for Greece and Exit, but didn’t happen and probably won’t happen. Even though, this was no humans-conditions to live. No money, no food, no jobs. The only obvious way to fix this problem might be to write off the debt entirely. To many people this may not seem right, but it is right to make an entire nation suffer endlessly, without a time to end, because of its impossibility to be solved? Let´s emphasize one more time, this is a huge-non-fixable-mistake, and this is not the people´s fault, but instead a result of bad governance. The EU and the EURO was a bad idea. And the downfall of the EU and euro is imminent, only a matter of time, but Greece refuses to leave the sinking boat. …or should it be Cryptocurrency this time around? In this post we have barely scratched the surface of Greece´s story to fit this post, but it goes much deeper, and it deserves the eyes of the world upon their situation, deserving of mercy and empathy. Cryptocurrency in Greece, could it be? “Greece is not new to the world of cryptocurrencies notably Bitcoin. The country could consider a parallel digital currency, using Bitcoin’s digital security and transparency and the currency’s value could be hedged against future tax.” Greece’s former finance minister, Yanis Varoufakis claimed. As mentioned above, Greece, July 2015, the banks closed, ATMs were limited to 60$ bucks a day, leading the people to a much bigger crisis. People had to survive off of handouts, including the middle-class. At the time, Bitcoin ATMs were placed on the streets and people did turn to it. Even though, gold used to be the hedge in cases of depression, this time around cryptocurrency took that place. Blog Post “Cryptocurrency & Gold”. 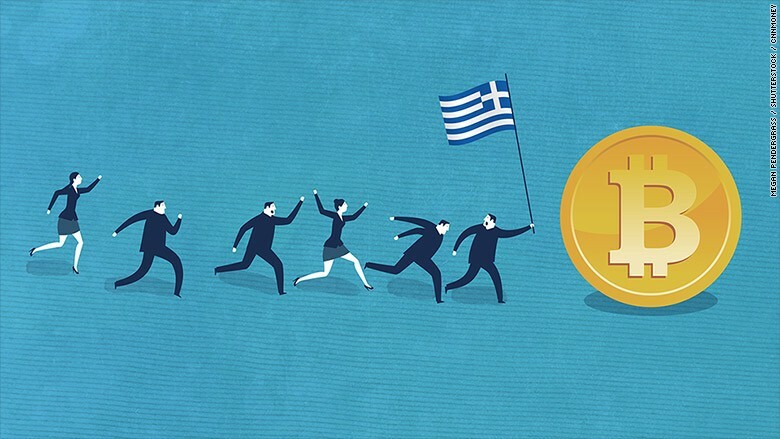 Greece´s bitcoin trading skyrocketed 79% at the time according to CNNmoney.com. Cryptocurrency´s nature is to be free of any centralized governmental ties and for obvious reasons it seems appealing to the Greek people. It represents financial freedom, security and a hope for a better life. Cryptos to Greece are like the light at the end of the tunnel. It does not solve every problem, as for the homeless for example, but if the country adapts itself it certainly is a new beginning. According to Thanos Marino, owner of BTCGreece.com, they started off with 10 transactions a day, and it is now up to 150 to 250 transactions daily. This is a Greek Bitcoin exchange in the Athens area, where many restaurants and stores started adapting to bitcoin. Cryptocurrency´s decentralized and global recognition is opening up doors to tourism to flourish again, boosting businesses and Greece´s economy one more time. As we can see, the benefits are obvious in the financial crisis Greece is facing. But now that Greece has put in place this new informal agreement giving Greece a little “break”, will it continue to embrace cryptocurrency, or will it let it drop? Make the people have had enough, and it will not let it go. Keeping it as a parallel currency might be the wise thing to do and the Greek people seem to recognize that. Can cryptocurrency reach out to the people who have been mostly affected by this crisis? How? CRYPTOCURRENCY USERS, WHO ARE THEY?